US, 1950, 112 minutes, Black and white. Sterling Hayden, Louis Calhern, Jean Hagen, Sam Jaffe, James Whitmore, John Mc Intyre, Marc Lawrence, Teresa Celli, Marilyn Monroe, Brad Dexter. 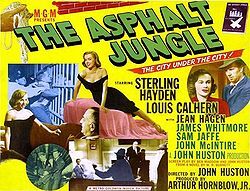 The Asphalt Jungle is now considered one of the classic crime films. It was nominated for many Oscars, but 1950 was the year of All About Eve and Sunset Boulevard, very strong competition. However, Sam Jaffe won the award for best actor at the Venice film festival that year. In many ways, the plot is familiar. However, the film was well written by Ben Maddow, and directed by John Huston. Huston had been a write in Hollywood during the 1930s and directed his first film in 1941, his adaptation of The Maltese Falcon. During the 40s he made a number of significant films including Key Largo and The Treasure of the Sierra Madre. After The Asphalt Jungle he directed The Red Badge of Courage, African Queen, Moulin Rouge. He was to continue making films for almost forty more years, his last film being The Dead, the adaptation of the James Joyce short story, in 1987. The film has a strong character actor cast all giving some of the best performances of their careers, especially Sterling Hayden, Louis Calhern and Sam Jaffe. It is of interest that Marilyn Monroe appears in two scenes – and was about to become famous two years later with such films as Gentlemen Prefer Blondes and Niagara. Jean Hagen, always a strong character actor, also has a substantial role. The film is meticulous in its presentation of the robbery and the characters and their working together. However, there are various character flaws in each of them, small betrayals, small difficulties which lead to the whole plot unravelling and leading to the mastermind’s death. Filmed in black and white, this film is a reminder of the strength of the Hollywood system in its golden years of the 40s. 1. The significance of the title and its overtones, indicating themes? This film is considered a classic of 1950. Why? Its impact now? 2. The importance of black and white photography, semi-documentary photography of the city, the details of the way of life of urban criminals, the details of the robbery? Music? 3. The film's interest in the crime itself, the portrayal of criminal as people, though unlikeable? How humane was the approach to these criminals? 4. The importance of the opening and the stalking of Dix? Audience introduction into this kind of jungle? The atmosphere and tone of the jungle? The asphalt as symbol for the urban jungle? 5. Dr Riedenschneider? His personality and type? The details of his character? His plans, his meticulous planning? His suspicion of others? Dix above the opinion of the others? Why was the doctor choosing him as a successful criminal? His patience in waiting in prison, planning? His weakness for women? Was he in any way a sympathetic character? 6. Dix as a kind of hero for this film? The world in which he lived, his background and his explanation of this, the petty criminal and his deals? His description of his dreams and their lack of fulfilment? The reasons for his getting involved with the criminals? A hoodlum making the big time? His interaction with the various men? His trust and lack of trust? The shattering of his dreams and the irony of his dying, in the field with the horse? 7. The portrayal of Doll? How sympathetic a character? Her weaknesses and dependence on Dix? Her support of him? Sharing his dreams and their failure? 8. The portrayal of the minor criminals as important for the background of the film? Gus and his role in the bar, being lame, his help by using the phone? The other minor criminals, for example, the man with his wife? The impact of the robbery on them? Their attitudes towards the police? 9. The importance of Alonzo? A public figure, opulent style, working for the law, yet his cynical approach to life, his liaison with Angela, his disregard of his wife? His living beyond his means? An evil man yet weak? His joining in the plans? His double crossing his lawyer? Yet his fear of violence? His attitude towards death in his house? His plans for robbing the criminals? His attention to his wife and its irony? asking Angela to protect him? The significance of his killing himself? How accurate a portrayal of this kind of criminal and weak man? 10. Audience response to the atmosphere of double crossing and murder? 11. The importance of the portrayal of the police? The background of the pressure by Hardy on the minor police? 12. The crooked policeman and his deals? His pressurizing the minor criminals to save himself? Audience response to this kind of crookedness? 13. The contrast between Angela and Alonzo's wife? Angela and her seeming innocence? Her relationship with Alonzo? Her confusion when the police interrogated her? The contrast with the bedridden wife, and her wanting to play cards with her husband? 14. The significance of the police torture and making the criminals talk? 15. The culmination of the film in the long presentation of Doc's arrest, His escape, his delaying to watch the girl dancing, the quiet of his arrest? How dramatically important? 16. Dix and Doll escaping? His being wounded? The significance of his dying in the field with the horse? 17. Why did the film give such attention to the details of the robbery and its execution? How involving for audiences? 18. The themes of right and wrong, the criminal mind and honesty, the pressures of crime within the city, law and justice?